On our last release we’ve improved emotion tracking for clients. In this release we’re bringing the results to your dashboard. Get a better view on how your client is progressing by seeing the changes in their emotions. We’ve also made it easy for you to test out the Therachat experience in the client app and link that back to the dashboard on the web. Get more insight in how your client is doing by checking their progress over time on your therapist dashboard. See how intense they felt emotions and use that data as a starting point of check-ins in- or outside of session. If your client would like to share their Therachat data with you, they can now easily invite you to Therachat, even if you’re not using it yet. You will get an email saying that a client would like to use Therachat with you. When you sign-up, you’ll automatically be linked to your client and start seeing their data on your Therachat dashboard. Download the client app, test it out and see your own data popping up on the web dashboard by logging in. This allows you to fully grasp the experience your clients will have before inviting them. 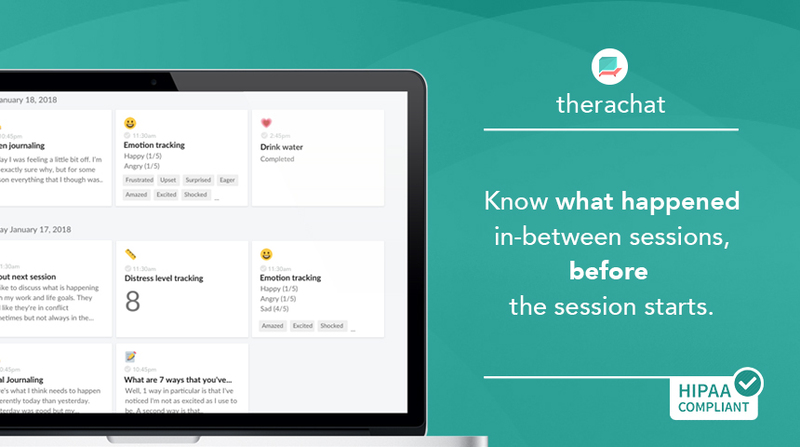 Let Therachat stimulate your clients to journal, track emotions and do your custom homework activities. Start your 14 days free trial now!